(Nanowerk Spotlight) Microorganisms attach to surfaces and develop biofilms. These biofilms are an assemblage of surface-associated microbial cells that are enclosed in an extracellular polymeric substance matrix and irreversibly associated (not removed by gentle rinsing) with a surface. Noncellular materials such as mineral crystals, corrosion particles, clay or silt particles, depending on the environment in which the biofilm has developed, may also be found in the biofilm matrix. Attachment of biofilms – a highly interconnected bacterial community – is a complex process regulated by diverse characteristics of the growth medium, substratum, and cell surface (for more on biofilms read the CDC's article: Biofilms: Microbial Life on Surfaces). While biofilms are mostly seen from a point of view of pathogenic threats, their complex frameworks with biological behavior, chemical heterogeneity, and physical structure at micro- or even nanoscopic level, could also be useful in nanofabrication – each of these properties can be an attractive avenue for the development of nanotechnology and material science. Researchers at the State Key Laboratory of Electroanalytical Chemistry at the Chinese Academy of Sciences (CAS) have now systematically demonstrated the potential of biofilms for nanostructure engineering in three aspects. 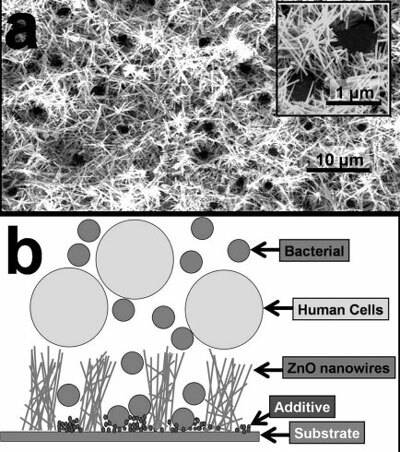 Reporting their findings in a recent issue of Advanced Materials (Biofilm-Engineered Nanostructures), they describe the use of biofilms as engineering materials for nanostructures and demonstrate it using zinc oxide nanorods. Led by Xiurong Yang, a professor at the Changchun Institute of Applied Chemistry , the researchers present simple strategies that can be widely applied to the immobilization, fabrication, and organization of nanostructures, as long as they can be prepared in aqueous solution and the precursors can react with the bacterium. This research shows that, in principle, biofilms can be an efficient and low-cost approach for large-scale nanotechnology fabrication of various nanostructures. "The ingenious structure of biofilms can lead to the synthesis of fantastic nanostructure devices, even beyond the fabrication capability of the current state-of-the-art methods" say the authors. Using the example of zinc oxide nanostructures, the CAS team explored the use of biofilms in three aspects: immobilization, morphological organization, and selective permeability. They began with the fermentation of Streptococcus thermophilus, a lactic acid bacterium that is widely applied in dairy industry. They then used the resulting biofilm to immobilize zinc oxide nanorods on a polystyrene substrate with a curved surface (the inner wall of a centrifuge tube). These as-grown zinc oxide nanostructures remained quite stable after irradiation sterilization. This technique also worked on other substrates, such as glass, silicon, and indium tin oxide. "Different from Streptococcus thermophilus, we noticed that Staphylococcus aureus cells could maintain their external shapes in the benign zinc oxide growth conditions even dead for several hours," say Yang and his colleagues. "Their well-defined morphologies may thus direct some specific zinc oxide hierarchical fabrication. One possible process is that, once the zinc oxide nanocrystals are immobilized on the cells surface, they will serve as nucleating seeds for the further adhesion and growth." Since biofilms are gel-like matrices that can be easily adhered on several substrates it therefore is feasible to use such bilateral adhesive behavior – 'cell?substrate' and 'cell?nanoparticles' – to immobilize the nanostructures on various types and aspects of substrates. The authors conclude that this strategy may be applied in medical coatings, commercial packaging, and biological sensing, because of its flexible properties and excellent biocompatibility.